ASUS announced its first professional OLED display back at CES 2018 over a year ago. The compact and lightweight 21.6-inch 4K monitor covering 99% of the DCI-P3 color aimed at professionals attracted a lot of attention from various parties, but it has taken ASUS quite some time to perfect the product. Only this month the company began to sell the display on select markets with broader availability expected going forward. Meanwhile, the price of the monitor looks rather overwhelming. 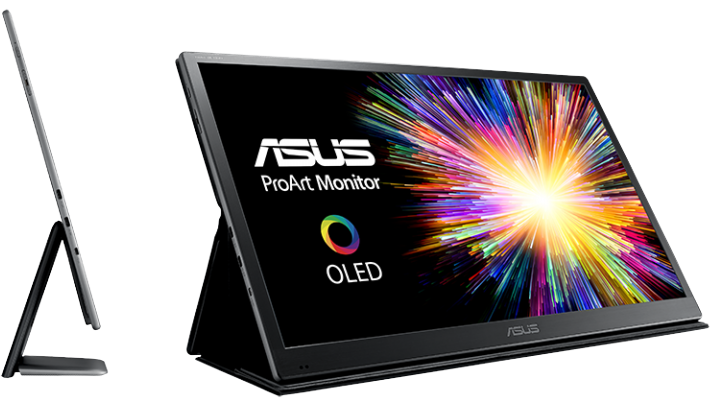 The ASUS ProArt PQ22UC features a 21.6-inch 4K RGB stripe OLED panel produced by JOLED using its printing method. The panel supports a 3840×2160 resolution, 140 - 330 nits brightness (typical/peak), a contrast ratio of 1,000,000:1, and a response time of 0.1 ms. The monitor features an internal 14-bit 3D LUT (lookup table), can reproduce 1.07 billion colors, and comes factory-calibrated to a Delta E <2 accuracy. The ProArt PQ22UC is said to feature a 95% uniformity compensation to avoid fluctuations in brightness and chromaticity on different parts of the screen. ASUS says that it can cover 99% of the DCI-P3 color space (without specifying whitepoint chromacity) and supports HDR10 as well as HLG formats for high dynamic range content. Meanwhile, ASUS yet has to reveal which other modes the display supports (e.g., REC2020, REC709, etc.). Besides very accurate colors and a very high contrast ratio, the main features of the ProArt PQ22UC are its compact dimensions, a foldable stand, a foldable protection case, as well as a low weight (about a kilogram or so with the stand). To further save space and make the product thinner, ASUS equipped the the ProArt PQ22UC with two USB Type-C and micro-HDMI inputs (no word on exact protocols, but DP 1.2 and HDMI 2.0x are likely). The compact dimensions and weight enable owners to easily carry it around, which is particularly important for people who need to do post-production outside of their studios as well as various on-set routines. 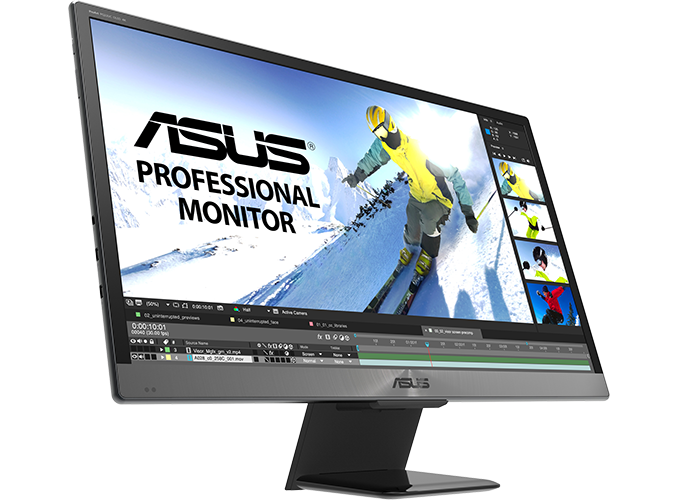 ASUS does not ship the monitor with a light-shielding hood, a common accessory for displays used for cinematography and color-critical workloads, due to its portability. The ASUS ProArt PQ22UC display is now available from select stores in Austria and the UK for €5,160 and £4,699 with taxes. TFTCentral claims that broader availability is expected in April, but the official price for the UK will be £4,799 with taxes. If we roughly subtract the UK sales tax from the current retail price and convert the sum to US Dollars, we will get something like $5150, which means that the product will likely carry a ~$5000 MSRP in the US. $5k is a BIT? Doesn't even conform to any HDR brightness standard, which is what any artist paying for an HDR monitor would require. Well considering the OLED DisplayHDR certification was only recently introduced in January. It is not surprising this monitor has not gone through the certification process since Display HDR 400/600/1000 are only for LCD panels. It's not because the standard is recent, it's because this monitor doesn't meet it. The lower standard, DisplayHDR 400 TrueBlack requires 250cd/sqm for full screen and 400cd/sqm for local flashes. This monitor only does 140 and 330. "The response time of this OLED is pretty sick though."